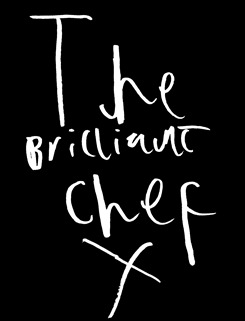 The Brilliant Chef: Big Bro's Big day! You might remember that last November I had a big day when I made it to the cook-off final of Kent Cooks. Well, my big brother is really clever at stuff too and he made it to the final of something that involves food but not cooking or eating it. Produced in Kent had an art competition to make food pictures using local and seasonal fruit and veg and this is the second year in a row that my brother got through to the live final. Last year the theme was the Olympics and he made some potato people doing fencing with Asparagus swords and this year the theme was Kent's food and farming landscape. He designed this bunny rabbit in fields. Both last year and this year we wrote to our local Waitrose store to tell them about the project we were doing. Because we are home-schooled, each year we spend some time looking at where food comes from, growing some of our own vegetables and learning about why it is important to buy food that is produced nearby and in season. Waitrose were really kind and gave us a £25 gift voucher this year so J could buy the fruit and veg he needed for the final. We had arranged that me and my baby sister would stay with granny on the day so that my brother could focus on his work without us distracting him, but at the last minute I decided to go along with him because I didn't want to miss out on anything! I wasn't allowed to actually help him with his picture because he had to do that all by himself but I helped by getting him a drink of water when he was thirsty and by helping to tidy up afterwards. I helped eat some of the food when it was time for high tea with sandwiches and cakes - yum! And Granny and my baby sister joined us afterwards too to see my brother get his certificate and prize. He came first in the individual category!